Growing up is hard! 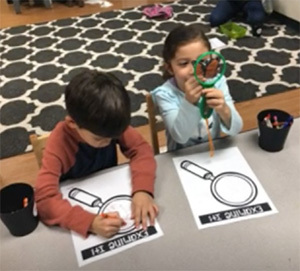 Whether an insect, a reptile, a bird, or a mammal, PreKindergarten-4 students are learning that every animal must go through different phases before officially becoming an adult. For the past few weeks, our students have been focusing on the four-stage life cycle of ladybugs and butterflies, and even learned a brand new big word: metamorphosis! This project, part of the “I Wonder Why” unit of inquiry, has been hands-on and inquiry based, as the children have grown their own ladybug farms and butterfly gardens. Starting with the arrival of the very first caterpillars and ladybug larvae, students have been observing, predicting and journaling the changes along the way. Last week, each of the six Painted Butterfly caterpillars crawled to the top of the jar and attached to the lid and hung in their “J” shapes. The students observed as they transformed into their chrysalides or pupae stage, then transferred the delicate pupae to their larger net in anticipation of their hatching from their chrysalides. As for the other insect friends, the Pink-Spotted Ladybug larvae have grown longer and are also changing into their pupae stage as they have curled up and formed hardened shells. The I Wonder Why unit is part of the IB Primary Years Programme Transdisciplinary Theme: How the World Works. Throughout the PYP (taught to children ages three – fifth grade), the transdisciplinary themes focus on issues that span subject areas. How the World Works is an inquiry into the natural world and its laws; the interaction between the natural world (physical and biological) and human societies; how humans use their understanding of scientific principles; the impact of scientific and technological advances on society and on the environment.